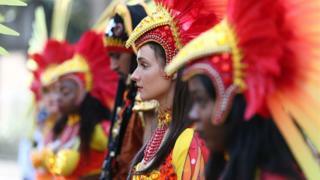 Hundreds of thousands of revellers descended on Notting Hill for the final day of carnival. Colourful floats passed within half a mile of the blackened tower and revellers were encouraged to lower their music and walk respectably. People were asked to wear "green for Grenfell" to remember the fire victims. 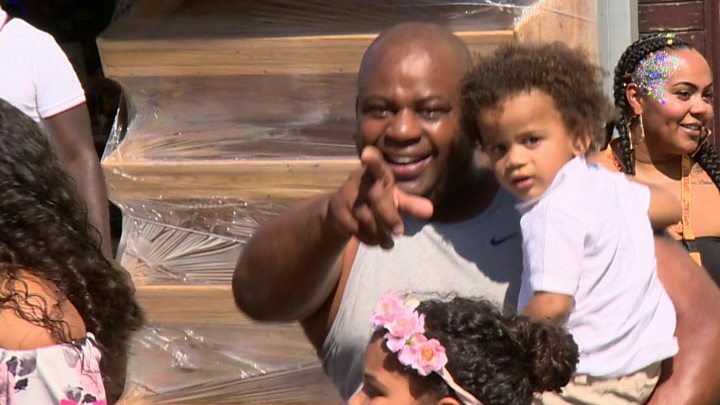 The entire procession paused for a second time in two days for a minute's silence to remember the victims of the Grenfell fire on 14 June, in which more than 80 people are believed to have died. The moment was concluded with a spontaneous round of applause and cheers, while firefighters were embraced and thanked. Local MP Emma Dent Coad wiped away tears following the silence, which she observed with firefighters outside North Kensington fire station. "It's a really, really lovely atmosphere," she said. "There's gorgeous weather, there's a lot of good feeling out there, a lot of people wearing green, and I think it should continue in that vein." Is the fun being sucked out of Notting Hill Carnival? Partygoer Dianne Larrington told BBC Radio London: "I've been coming to carnival since I was eight years old and I love it. "I cannot ever remember it being this hot at a carnival. "Everyone is looking beautiful and gorgeous - don't believe the hype, people are just here to enjoy themselves." And prominent female dancehall singer Spice, visiting from Jamaica to perform at the festival, said: "Carnival is all about fun and excitement and that's what I'm here to bring. "I see people in the street having a good time, and I've been dancing and enjoying myself. "That's what carnival is all about." On Monday night, the Met Police said there had been 313 arrests across the two-day event. Suspected drugs offences accounted for most of the arrests (112), followed by possession of an offensive weapon (58). This year's total is lower than last year, when more than 450 people were arrested over the two days. The London Ambulance Service said it had treated 344 patients during the first day of carnival - many for alcohol-related injuries. London Mayor Sadiq Khan said on Sunday that although the 51st carnival took place in a "context of sadness and sorrow", it was a celebration of London's diversity. A heavy police presence marked the carnival route on Monday, with steel barriers and concrete blocks there to prevent a Barcelona-style terror incident or acid attacks. Day two of the Notting Hill Carnival and another million people hit the streets to enjoy Europe's largest street festival. If revellers were concerned about the possible terror threat then they did not shown it. The challenge for those policing them has been how to make carnival safe without compromising its sense of fun and freedom. Despite the checkpoints on the outskirts, which vet each vehicle that comes into carnival - a so-called ring of steel - police retained their laid back approach where possible. Some wore flowers around their necks, while others danced to the reggae and dub blasting out of sound systems. After a year of terror and tragedy in London that for many at carnival has struck way too close to home, this community has united and shown the world their sense of joy will endure. Of the terrorism threat, one performer said: "Anything can happen to anyone anywhere and that's what terrorists want you to do - to be inside and be afraid. "You can't do what they want you to do, you have to live your life so no, I'm not worried about it." About a million people usually attend the carnival, making it Europe's biggest street festival.